California is trying for the record for the biggest scratcher lottery ticket – in the literal sense. The new Super Ticket issued by the California Lottery is 8 inches by 12 inches – just a tad smaller than an A4 sheet of paper! It may not offer the biggest prizes, but the top prize is still a cool million dollars. It gives the player multiple chances to win though. On the ticket itself are four separate games which offer 52 chances of winning. These are the Quick 6’s, the Funky 7’s, the Wild 8’s, and the Neon 9’s. But if you don’t win a major prize in any of the four games, you can still enter the ticket for second chance drawing. At $10 a pop, players sometimes refer to them as the big one. A man tried one card, and won back his $10 in one of the games. Since the ticket can still be entered in the second drawing, in his case that second chance comes free. 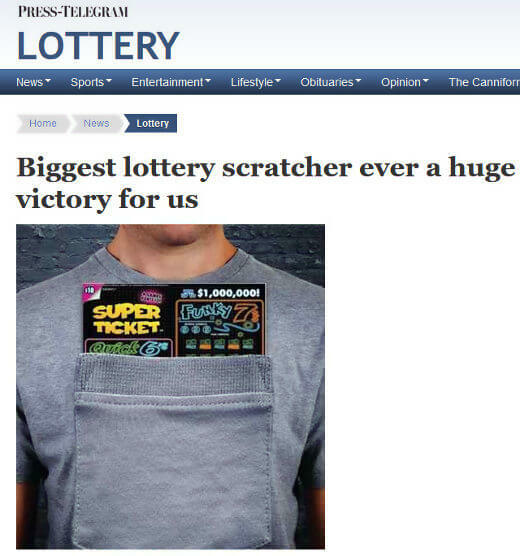 There is no word on whether the lottery prohibits folding the big scratch off ticket, but already there are lots of jokes about how to keep them in your pocket! Man Wins $200,000 On The Same Scratcher Twice!